When you navigate through our websites, you leave behind digital traces. Some of these traces could allow inferences to be made about your person, even though that is neither practically possible nor desirable for this website. In the subsequent sections, we shall inform you about what to expect when you visit our website, with regard to your personal data. In principle, the following applies: You can use these sites without us knowing your identity or trying to find out who you are. The personal data (‘digital traces’) generated when you visit a website not only include the data possibly submitted through the contact form, such as name and address, but also the IP addresses. The IP address is the number allocated to a computer (or smartphone, tablet, etc. ), that is used to identify the computer on the Internet. The IP address of the computer accessing the website must be known while transferring websites online. However, we do not know the identity of particular users and we do not try to find this out. When you access our websites, information is automatically transmitted from your browser to our website server in the background. This information is temporarily stored in a so-called log-file. As a principle, we do not capture or store the whole of your IP address. It is only captured/stored in an abbreviated and hence anonymised form. various other administrative aims are achieved using this data. Article 6 (1) (1) (f) GDPR permits us to collect your data for these purposes. Our legitimate interest in the processing of this data is derived from the above-listed purposes. You can request brochures and information about our products and samples via email. You can also use our contact form for this purpose. If you send us an email, we shall store your contact information contained in the message as well as the contents of the message, and we shall use this information to process your inquiry. Please remember that an unencrypted email is not sufficiently protected against perusal, modification or erasure by third parties. If do not want to take this risk, please give us a call. We shall only use your personal data from the emails for as long as your inquiry is still being addressed; it will be stored for another four weeks after responding to your inquiry and will then be deleted. If you are a business customer, we are obliged to archive your inquiries made through our websites for a period of six years. If you use our contact form for making an inquiry, we shall store your contact information and message for the purposes of processing your inquiry. The information required by us for processing the inquiry is marked with a star; all other information is optional. If you have ordered a sample, your data from the order will be stored for a period of six months for internal purposes (evaluations and avoidance of duplicate orders) and thereafter it will be erased. 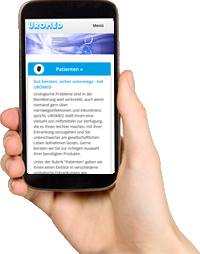 You can send us your application at https://karriere.uromed.de/. You can find information on how your data is handled within the context of an online application here. As a rule, we do not share any of the data obtained during your visit to our website with third parties. The data processed by the cookies is necessary for safeguarding our legitimate interests as well as those of third parties, owing to the purposes already mentioned and in accordance with Article 6 (1) (1) (f) GDPR. Most browsers accept cookies automatically. However, you can configure your browser in such a way that no cookies are stored on your computer, or so that a notice always appears before a cookie is activated. Complete deactivation of cookies can, however, lead to the fact that you will not be able to use all our website’s functions. We use the web analysis tool called ‘Matomo’ (formerly known as ‘Piwik’) on this website. We do this because we are interested in knowing, for example, where the users of our website come from (Northern Germany, Southern Germany? ), whether public events have any influence on the number of people accessing the website (more users after a presentation? ), what content users of our website are particularly interested in (topics), and how we can continuously improve our website based on this information. Matomo works with anonymised IP addresses in the version we use. In this process, the IP addresses are first abbreviated to the last four digits before being used to analyse user behaviour. Case law and literature pertaining to data protection provisions is strict in its judgement of the question as to whether an IP address is actually considered anonymous. The abbreviation of the IP addresses in the way described gives rise to anonymous data, according to the unanimous view, without the possibility of establishing reference to a living person. This cookie has a lifetime of almost six months. Furthermore, Matomo will also create a so-called session cookie, which will automatically be deleted after you have left the website. According to Article 15 GDPR, you can demand information about your data that is being processed by us. If we have incorrect or incomplete data about you, you can demand the rectification of this data (Article 16 GDPR). You can even demand the erasure of you data (Article 17 GDPR). However, there can be cases where we may or must not delete your data, despite your wishes. If you demand the erasure of this data, we shall first check whether there are any such reasons. If not, then we shall erase your data. The alternative to the erasure of your data is, in certain cases, a restriction of processing of your personal data (Article 18 GDPR). Here, too, the following applies: let us know how you want to proceed, then we will check the legal requirements and find a way to balance your and our interests. If you believe that we are not complying with the data protection regulations for processing of your personal data on this website, you can lodge a complaint with a data protection supervisory authority. You can find a list of all European data protection supervisory authorities here. We have appointed a data protection officer, who will constantly support and advise us regarding compliance with the data protection provisions: PrivCom Datenschutz GmbH, Dr. Bettina Kähler, info(at)privcom.de. Our websites are encrypted using SSL, i.e. the online transmission of websites is protected against those viewing from outside.